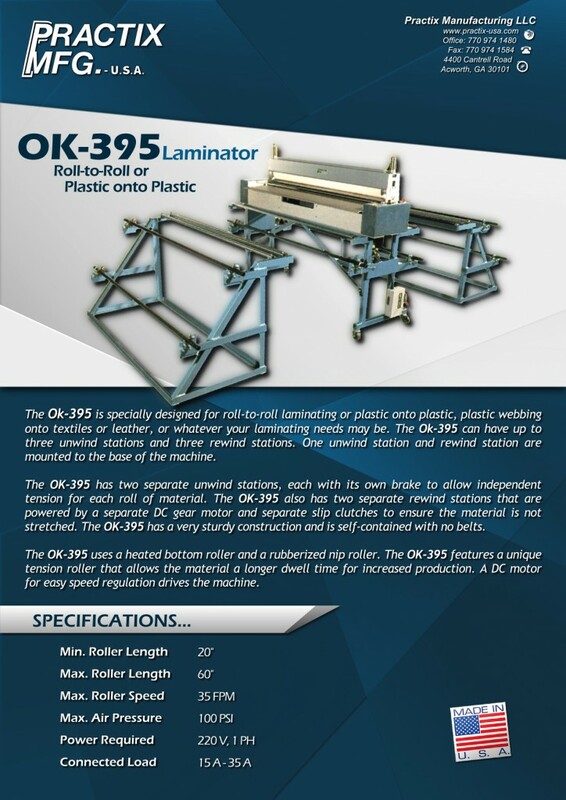 The Ok-395 is specially designed for roll-to-roll laminating or plastic onto plastic, plastic webbing onto textiles or leather, or whatever your laminating needs may be. The Ok-395 can have up to three unwind stations and three rewind stations. One unwind station and rewind station are mounted to the base of the machine. The OK-395 has two separate unwind stations, each with its own brake to allow independent tension for each roll of material. The OK-395 also has two separate rewind stations that are powered by a separate DC gear motor and separate slip clutches to ensure the material is not stretched. The OK-395 has a very sturdy construction and is self-contained with no belts. The OK-395 uses a heated bottom roller and a rubberized nip roller. The OK-395 features a unique tension roller that allows the material a longer dwell time for increased production. A DC motor for easy speed regulation drives the machine.